In the last several years property owners and developers have begun to embrace the notion of green buildings as exemplified by the growing number of new buildings meeting voluntary Leadership in Energy and Environmental Design (LEED) requirements. California has been a leader in addressing many environmental issues, and government agencies are starting to recognize the need for integrated, long-term solutions to complex, interconnected problems. Most notably the Department of Conservation and the Department of Water Resources have been requiring a more holistic approach to water management in the wider context of natural resource stewardship. A simple example of such a holistic approach is the installation of a satellite-controlled irrigation system to avoid watering landscaping during or after the rain. The system saves the property owners money in the long run, helps the water company conserve water, reduces environmentally harmful runoff, and is a source of civic pride. Such a project is clearly beneficial to everyone and there is sufficient impetus to proceed. Conversely, a development project that results in landslides at the edge of a housing tract is just as damaging to the value of the property as it is to the environment, and the property owner is unlikely to proceed knowingly. So again the positions of the stakeholders are aligned. In both cases the win-win seems obvious. However, many times the mutual benefits or detriments are not so obvious and there is no common ground because each stakeholder is too narrowly focused on its immediate concerns to think about how its long-term goals could be refined to be more in tune with those of other stakeholders. • Property owners and developers focused on the value of their assets and costs to maintain. • Water companies focused on providing water reliably and efficiently to acceptable standards. • Civic leaders and municipal departments focused on providing for the welfare of the community. • Environmental advocates focused on maintaining functional and sustainable ecosystems. Unfortunately it may not even be clear what stakeholder interests are involved. A homeowner may also be a local government official and a member of an environmental group. Different departments in the same municipality may have contradictory missions. There are other constituencies involved too. These include regulatory agencies that define and/or enforce environmental, health and safety standards, and scientific researchers that provide objective technical advice to help the decision-making process. Regulatory agencies themselves may also be land owners, grant sources and scientific advisors. Agencies, too, may have conflicting missions. What this means to each constituency must be defined so that everyone may see the common ground. 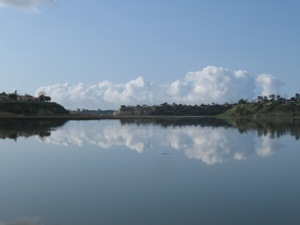 NBC has already begun developing a single document that sets forth specific attributes defining the “Desired State” from the perspective of Civic, Water Supplier, Property Owner and Ecological constituencies, and provides a roadmap for fulfill a collective sustainable vision for the Newport Bay Watershed twenty years or more from now.